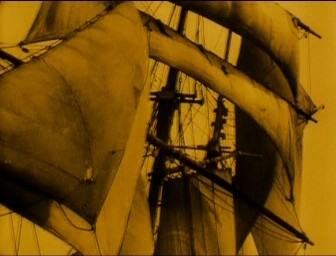 Compared has been the non restored public domain version (Internet Archive) with the within the years 2005/2006 restored version, released on DVD in Germany, England and the USA featuring different bonus material. 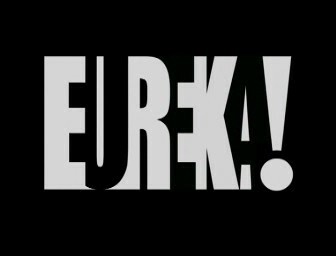 For comparison the UK DVD from Eureka! 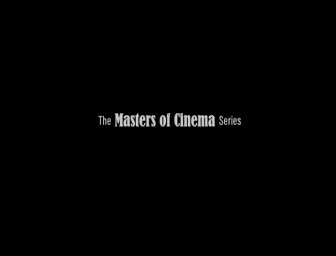 (The Masters of Cinema Series #64) was at the author’s hand. 2 extended scenes with an additional running time of + 7 sec. The remaining running time difference mainly results from different inter title fade-ins plus the shorter opening and final credits of the Public Domain Version (the total difference is about 2:19 Minutes - see cut report). 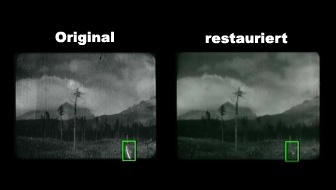 Further differences ( < 1 second) are the result of film tears, skipped or blurred images and so on because of the different sources of the film material. Before fading in and after fading out of the inter-titles there is sometimes a loss of single frames. But this is only mentioned in the cut report when a missing aperture opening results in a hard-cut (as at Minute 56:59). 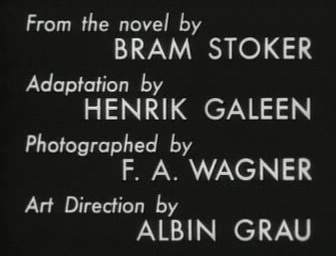 De facto no Nosferatu output equates to others. 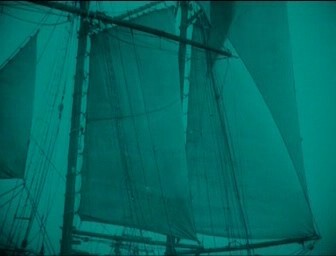 Different frame rates, cuts, different color and sound versions as well as inter titles in different languages and designs seriously changes the appearance of the movie. It would be presumptuous to choose one of these versions as "the reference", especially as more releases will surely follow in future. 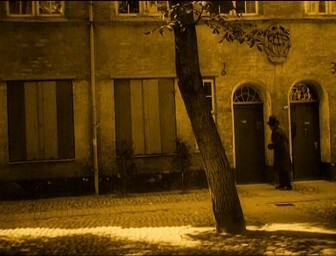 Jörg Gerle is completely right writing in his Film-Dienst review: "Similar to the times when "Nosferatu" came to theatres in various interpretations, today there isn’t merely a final version but rather a large variety of more or less succeeded versions each one occasionally worth a search for in the World Wide Web." That means: Every version has its right to exist and therefore the question about the sense of such "cut report" is absolutely eligible. Such a comparison is always yet interesting. Not least because to show the reading public the immense effort for a restoration and the abundance of patience for all parties involved to collect and stitch countless pieces of the puzzle during months, years or even decades to an ordered whole. 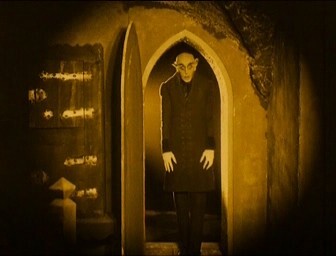 Since there went by more than 70 years after the originator’s passing away "Nosferatu" is deemed to be Public Domain in the USA. So this opus is no longer subject to copyright law and can be copied and distributed for free in the United States. Some American websites, including the "Internet Archive", benefit of these circumstances and offer public domain movies for free an legal downloads. 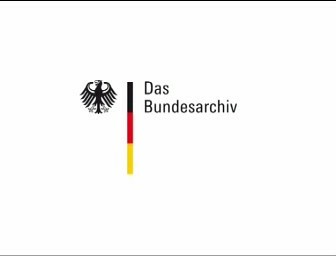 German users at all costs should keep in mind that American Public Domain regulation is not identical with the European one. So what’s legal in the USA can have inconvenient consequences over here. To take a single example: It is quite possible that a Public Domain Movie is still subject to copyright law in this country. 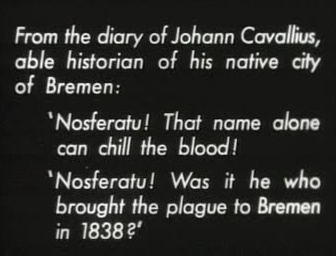 Due to the complexity of this subject it is only mentioned at this point that "Nosferatu" can also be downloaded legally from German users from Internet Archive. This doesn’t apply - if one stumbles across – for restored versions because of independent publishing and artistic achievements (new composed movie score, new designed inter titles and so on) what still can be subject to copyright law. 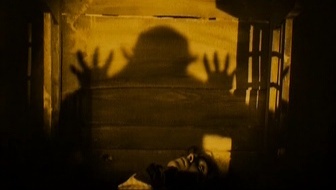 "Nosferatu – A Symphony of Horror" (1922) also like "Metropolis" is deemed to be one of the best known silent movie classics. 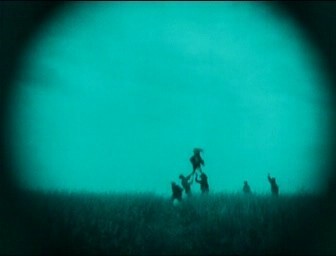 This popularity is no accident, has this movie yet heralded the Birth of the true-bred horror cinema. Sure, horror elements in movies existed long before but dread has been rather a side effect than intention. So far, no director has ever dared before leaving the audience back with trembling knees after the last scene. 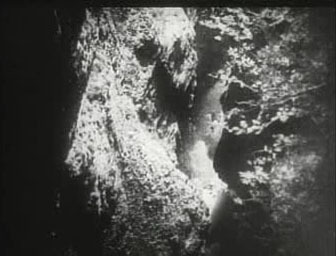 Friedrich Wilhelm Murnau broke with this tradition pursuing the ostensible goal to frighten the audience with his pictures banned on celluloid. The movie has been successful in many respects. 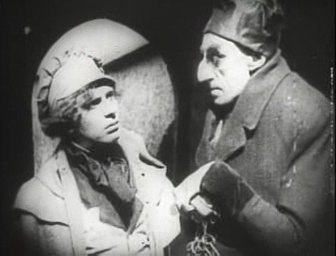 Max Schreck in his role as Count Orlok has been so much convincing that rumors go round he might be a real vampire (this idea has been made subject of discussion in a satirical manner in "Shadow of the Vampire" in the year 2000). 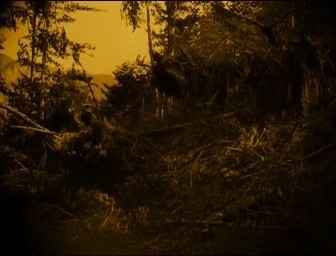 Also Murnau’s decision to shoot at the actual locations contributes to the gloom atmosphere. 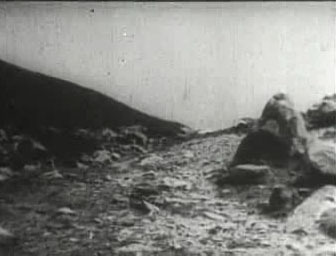 The film team travelled all across the country reaching the Carpathian Mountains where they found the perfect scenery for Count Orlok’s Castle in the Arwaburg. 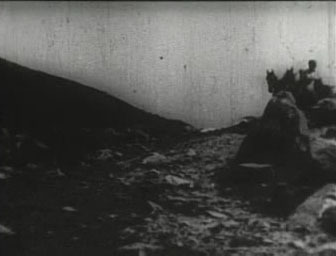 The numerous shootings of nature like gloomy mountain ranges, stormy sea, trees surging in the wind or clouds passing by the moon resulted in the absolutely demonization of the landscape. Not to forget the virtuosic play with lights and shadow. 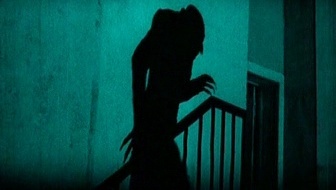 The legendary scene where Nosferatu’s shadow sneaks off the stairs up to Helen’s bed chamber hasn’t lost any of its fascination until now. 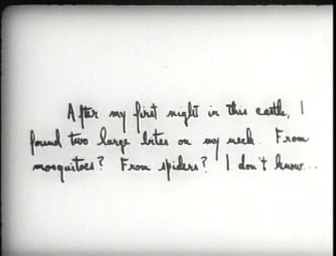 Murnau also succeeded with the creation of suspense on a subtly level. 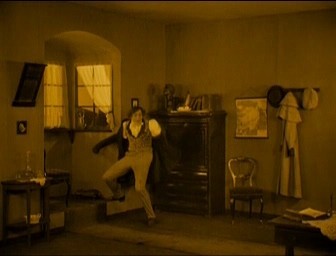 He therefore used a stylistic device which enjoys great popularity especially in the Action Genre: diagonals in motion. People or vehicles not only stupidly move from left to right or on a straight line from the back to the front but rather slantways through the scenery. This doesn’t only create a sense of three-dimensionality and dynamic but also generates a sense of latent uneasiness. 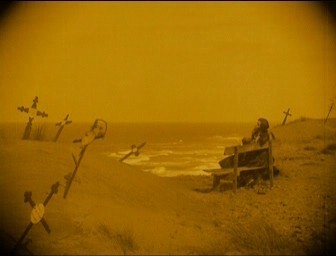 How the movie perfectly succeeds to influence the audience on a subluminal level is getting clear by watching the following scene: Ellen is sits on a bench at the beach waiting for Hutter’s arrival. She wears a black dress and to her left and right side crucifixes are plugged in the sand. This picture for itself appeals nightmarish enough because a burial site at this location is totally misplaced. But having a closer look it is getting clear that all crosses are tended right and also the surf in the background moves from the left to the right. 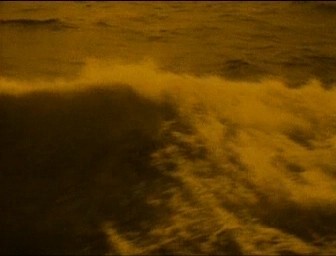 In the next shot Murnau only shows the sea where the waves now go in the other direction from the upper left to the right bottom side (diagonal movement). 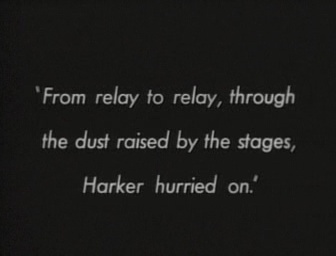 These contrary running direction patterns unsettle the audience the more so as Murnau cuts both scenes several times against each other. 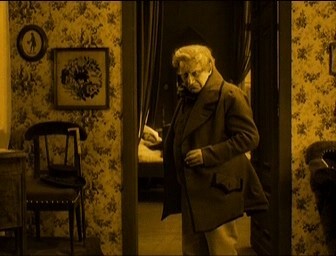 Also very interesting at this point is Murnau’s accurate use of framing: Remarkably often he places actors in the middle of portals, vaulted arches, door sills or the like what makes the corresponding detail looking like a painting. 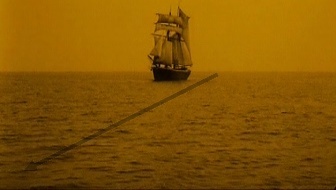 That this manner of representation is with intent and not by coincidence is proofed by the fact that Murnau made frame manipulations to obtain the desired framing effect. 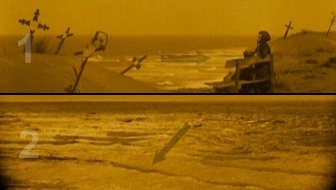 The vaulted arch on the screenshot down right (see red mark) wasn’t ever part of the scenery but a result of a subsequently masking of the according frame area. 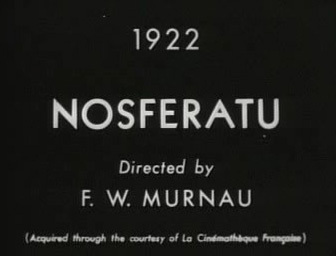 The innovative production of "Nosferatu" doesn’t manifest itself only in Murnau’s captured images. With more than 540 shots the German directing prodigy created a very fast cut movie for those days and also used cross-cuttings as an additional suspense element where he could describe two lines of action at the same time. 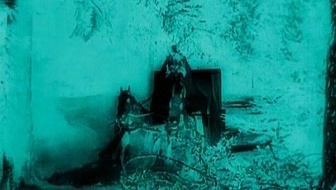 Even special effects has been deployed: By use of a negative filmstrip the night time coach ride turns into a weird trip through haunted woods (to get the color black on the negative filmstrip, Murnau draped coach, coachman and the horses with white blankets) and he also inserted time lapse and cross-fading effects. trivial commercial theater, gets along with no autotelic shocking and disgusting effects. 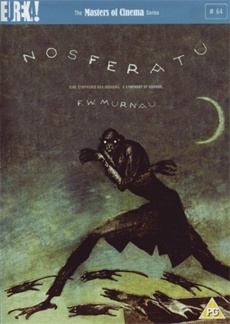 "Nosferatu – A Symphony of Horror" is loosely based on Bram Stoker’s "Dracula" (1897), the indeed most popular vampire novel of world literature. 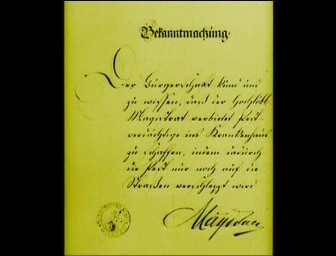 Murnau’s inevitable fate was the fact that he had not considered necessary trying to get the licensing for his script (what would have been a waste of time and efforts because the right of exploitation already was at hand of Universal Pictures). To smother up the dependence on the idea for this novel and to defend him from charges essential aspects of the plot have been altered and names and places have been changed. But there was one thing Murnau hadn’t reckoned with – Bram Stoker’s resolute widow Florence Stoker. 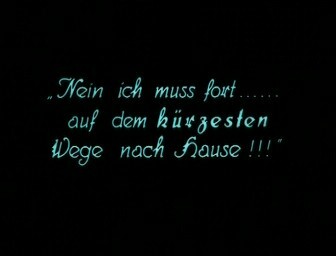 Without hesitation she took legal proceedings against Murnau in 1922 and won this case three years later at court of ultimate resort. At her urging a judgment of consequence has been pronounced which commands the complete destruction of all circulating reels. This could be realized in Germany but fortunately some miscellaneous copies had found their way abroad. 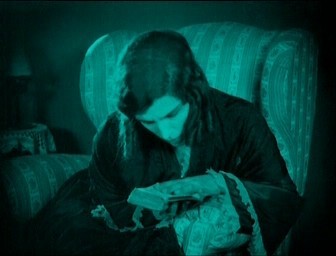 So it’s no wonder that a nitrate copy from France has been used as main source for the latest restoration. 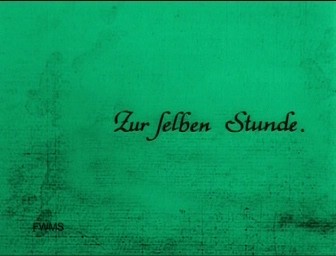 In 1930 a sound-movie with the title "Die zwölfte Stunde. 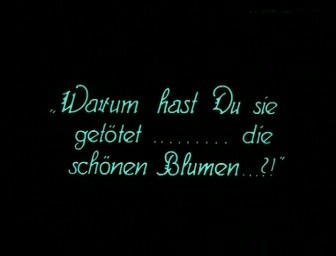 Eine Nacht des Grauens", a changed out of recognition and not authorized by the director version of the original movie has been released in Germany. 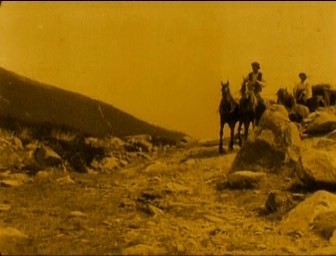 Numerous settings have been taken out retakes along with archive footage inserted and invented a Happy End via new cuts. Due to these serious changes further Copyright Thefts should be avoided. 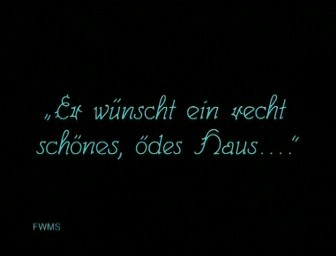 Not ’til the death of Florence Stoker in 1937 the ban was finally lifted from Murnau’s timeless masterpiece. 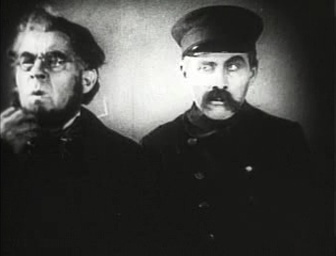 The danger to fall victim to destruction in this country "Nosferatu" could escape at the end of the thirties but the problem was that there apparently no further copy of Murnau’s Original existed. 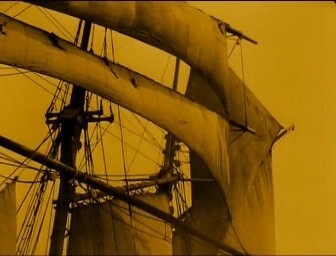 A vast number of different cut versions originated as time passed and practically each country the movie circulated had at least one or even more alternative versions in the archives. 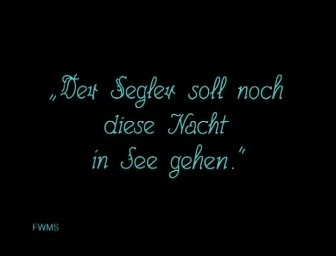 Some of them contained scenes Murnau never shot and yet others have been extremely new arranged or got rid of some scenes. Even the inter titles (more on this later) have been over a truly Odyssey. First they have been translated from German to French, then from French to English and later on back from English to German. Naturally the meaning has got distorted. 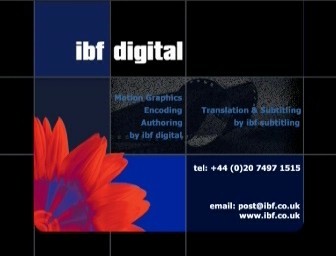 Some inter titles have been completely left out others have been falsified on purpose. 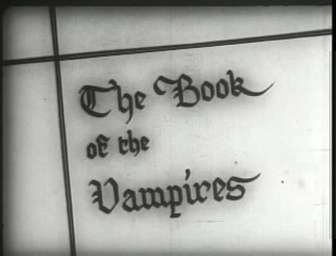 In one version for example Hutter doesn’t read a book about vampires in the travelling inn true to original but the bible. To restore the original version authorized by Murnau out of this conglomeration of different comparison materials would have been moribund right from the start under such circumstances. 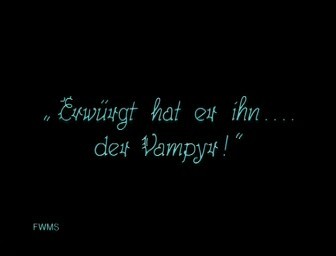 It was fortune that Murnau’s script of "Nosferatu" was on hand of the experts and with its help it was possible to identify quite authentic available and lost scenes as well as their chronology. Not till 1981 the exciting and difficult detective work led to presentable results. 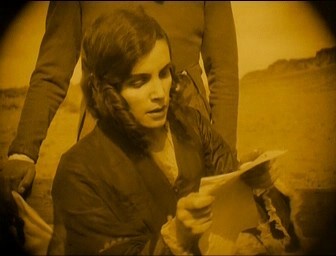 An extensive restored monochrome version, replenished with German inter titles and inserts (literally after the original title list), revived at the Cinémathéque Francaise. In 1984, 1987 and 1995 more restored versions followed. So people could relieve on the basis of a rediscovered tinted nitrate copy after which color schedule every single scene has been tinted & toned (more on this later). In addition poor or missing spots have been complemented. 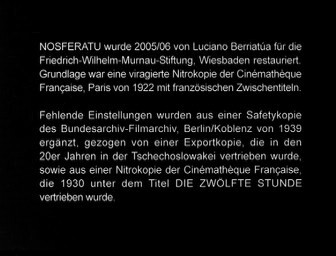 The up to now latest restoration (which is also subject of this cut report) took place in the years 2005/06 at the Friedrich-Wilhelm-Murnau-Foundation. 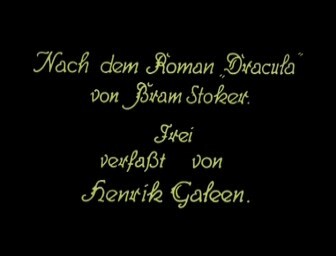 For the first time the original German inter titles mainly digitally restored found their way back into the movie. 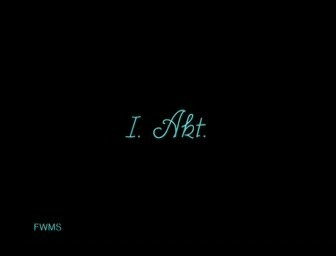 Lost inter titles had been reconstructed with the same typography. And also for the very first time insertions can be seen signalizing the beginning and the end of each act (five in number). Extraordinary diligence was dedicated on the visual processing. As working basis a 35 mm negative image, which has been digitized via film scanning and loaded into a restoring software program, was used. Afterwards the engineers cared for adjustments of image interferences, worn artifacts as well as brightness and frequency flickering – finishing touch for several weeks. Even the flutter image steadiness has been stabilized. For the coloring the original tones of the original version have been used as reference. Finally the movie speed has been adjusted to at that time common speed of 18 frames per second to gain a realistic running speed. Technicolor movie has been extreme expensive in its early days and experienced its breakthrough not until in the middle of the thirties. 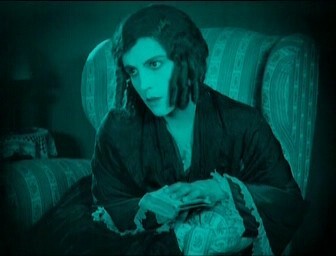 Consequently the possibility of affordable putting color into play has been badly limited during the silent film era. A complicated and expensive way at this time has been the coloring by hand where every image was colored with the help of templates in an extremely time-consuming process. More popular, because cheaper and less time-consuming, has been the tinting & toning. 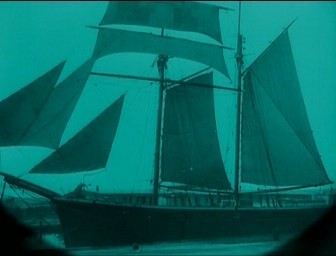 A unique toning color was added to complete scenes what has been entirely sufficient as dramaturgic stylistic device. 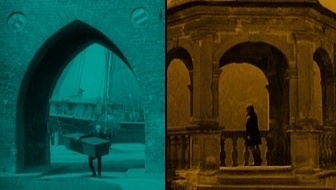 With the passing time a real color code emerged what helped the audience to appreciate the right mood of each scene. 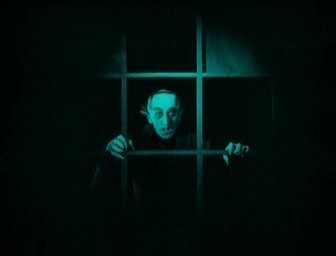 For a long time "Nosferatu" was only available in monochrome. But different aspects implied that the original version has been toned. There has been the fact on one hand that a vampire can’t walk around during daylight time. 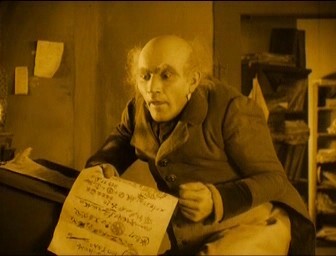 Just this Count Orlok had necessarily to do because the film making could hardly manage nightly shooting at this time. 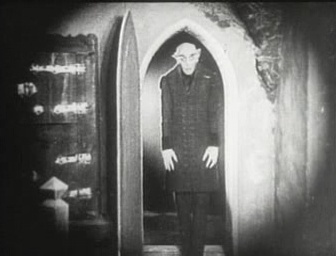 In the monochrome version Nosferatu so unmasks himself obviously as "Daywalker", what irritates in this respect when the vampire pulverizes in sunlight at the end of the movie. A visual distinction of daytime and nighttime scenes would have been absolutely necessary to eliminate this conflict. 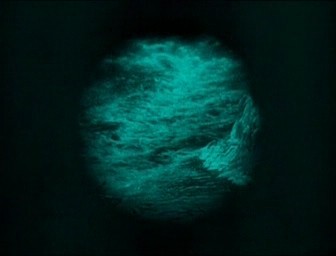 Another indication of a possible toning was found in the 5th act of the movie. Exactly at this point where the wind blows out a candle a cut has been identified indicating that the frame material has been edited separately before and after (for example to demonstrate the transition from light to darkness with different color tones). In the mid-eighties one come across a de facto toned copy of the first French version based on the same color code as the German version. 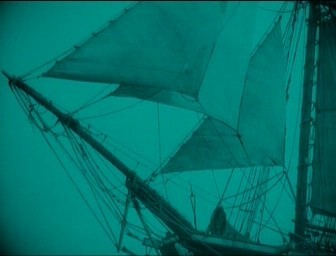 Finally it could be reconstructed in what tone the scenes had been colored. 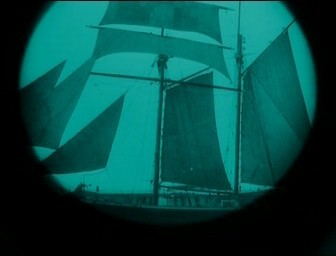 In the currently at hand restored version the nightly scenes are colored cyan and green, the twilight is colored pink and for the daylight scenes or candlelight a yellow tone has been used. 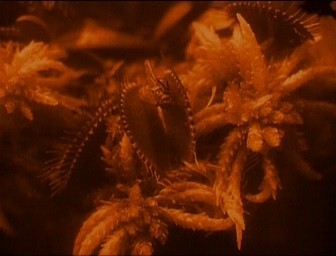 Only one scene is out of the ordinary: The scene where the Venus flytrap embraces its victim is colored in an orange and red tone. Versions based on earlier restorations incidentally feature partial deviating tones. 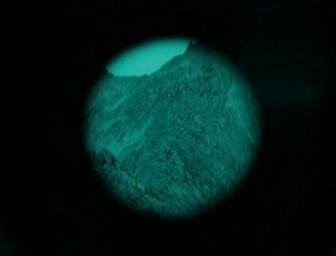 So are for example some specific nighttime scenes on the UK DVD from BFI (based on the 1995 restoration) not colored cyan but toned blue. 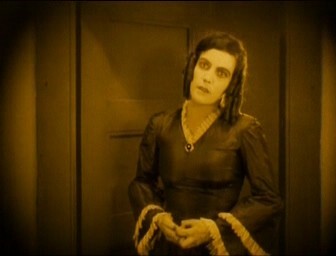 Silent movies usually were presented always accompanied by music. As a result of failing appropriate technology at that time live playing musicians cared for the adapted harmony whereas at the beginning one was satisfied with simple piano improvisations or opera set pieces. In the 20s some special composed movie scores became more and more important. 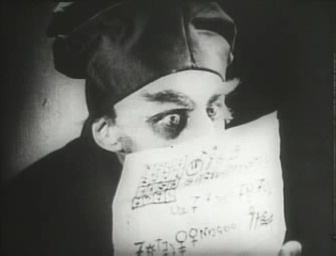 Besides the copy of the movie the distributer had to give also the corresponding sheets of music to the cinema operators. Many of these sheets have got lost during the decades o rare still slumbering undiscovered in dusty archives. 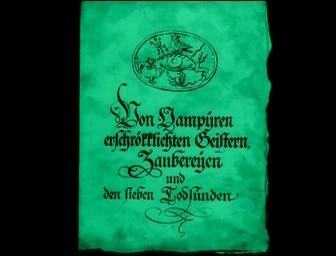 Even the original Nosferatu score, composed by Hans Erdmann was long believed lost. This determining factor is accounted for that the multiple Nosferatu releases of the latest years contain most different music scores (including even a Gothic Industrial Mix). Classified as particular successful are the orchestral arrangements of the English composer James Bernard, who also contributes the sound for many Hammer-Horror-Movies. 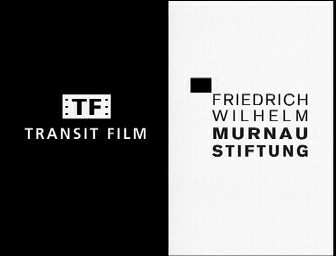 The current restoration of the Friedrich Wilhelm Murnau Foundation therefore features an extraordinary tidbit, the original movie score of 1922. It’s due to the composer and conductor Berndt Heller who reconstructed the opus via two classical suites based on the Nosferatu movie score and with the annotations of Erdmann’s book "Allgemeinen Handbuch der Filmmusik". However it should be mentioned that Berndt Heller hasn’t pioneered at all. Early in the mid 90s the conductor and musicologist Gillian B. Anderson could present a complete reconstructed version of the Nosferatu Score to the public what was never used as part of a new movie release but is exclusively live performed. 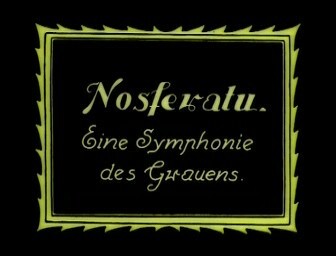 For a better understanding: The two so called Nosferatu Suites contain about 10 single pieces with a total playtime of 40 minutes. Because of the explicitly longer running time of the movie, unavoidably certain set pieces had to be repeated and possibly altered (say for the themed accompaniment of the main characters). 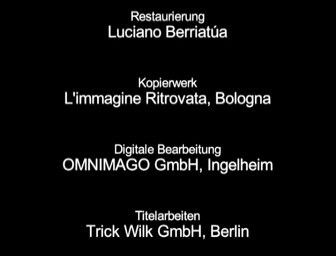 Just to say it simple, the whole trick has been to create with the available material a feature-length musical accompaniment coming pretty close to Erdmann’s original. 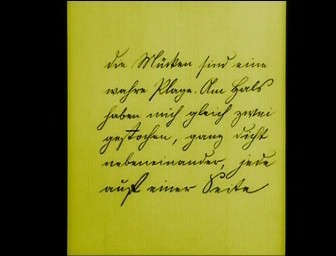 Divers notations of Erdmann (amongst others from his above mentioned book "Allgemeines Handbuch der Filmmusik"), provide an informative basis whereas however only for a fractional part of the movie complete instructions have been given for example the musical accompaniment for the last act). All the rest could only be reconstructed on base of profound speculations what explains the divergence between Anderson’s and Heller’s score. At this point a judging shall not take place but the one or other decision of Heller may be scrutinized. 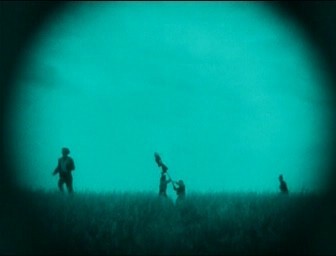 In several scenes Heller’s choice of music seems out of place especially when you compare to Anderson’s reconstruction. 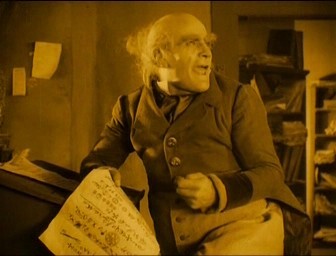 Best example is the famous key scene where Nosferatu visits Hutter’s chamber at nighttimes. Please compare Heller’s accompaniment (from minute 1:20 on) with the musical part Anderson provided exactly at the same place (a really clever fan has set to Anderson’s score a precisely fitting part of the Public Domain Version here for demonstration purposes). 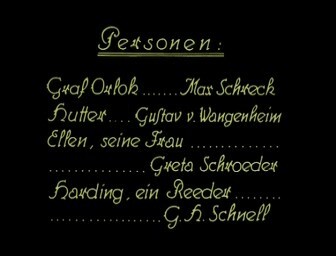 The local and personal names of the restored version entirely differ of these from the PD version whereas the names used in the restored version correspond with the ones of the original copy (see comments copyright law suit). 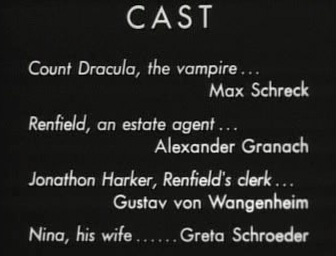 The differences results of the fact That when the movie came to the USA from France in 1947 the original names have been replaced with the names of Bram Stoker’s Dracula. These changes maintained when the movie found his way back to Europe. 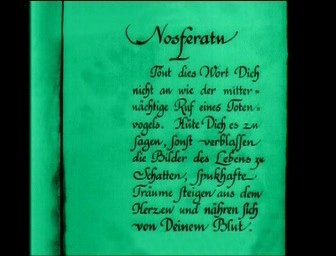 "Nosferatu" consists of 5 acts. 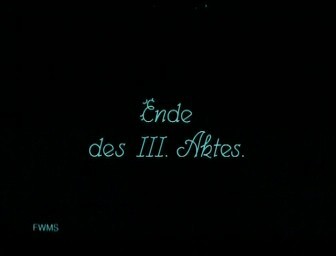 Contrary to the PD version the beginning and the end of each act is announced with inter titles in the restored version. This is how the first act begins. In the PD version one can see Ellen fooling the cat with a toy at the window sill. There is additional material in the restored version where Ellen Hutter puts aside the toy and takes the cat down from the window sill. After Ellen tenderly squeezes the cat she takes it down on the floor, has a seat taking her sewing kit. Subsequently followed by a scene where Hutter grabs his jacket and leaves the house. After Hutter presents his wife with a self picked bunch of flowers it is indicated in both versions that Ellen is not overly pleased with this present. But only in the restored version she addresses her husband regretting the death of the beautiful flowers. This sentence is of utmost importance because it contains the first dramatic moment respectively is an indication for the horror waiting for Hutter. Many of these subliminal messages will follow during the movie. 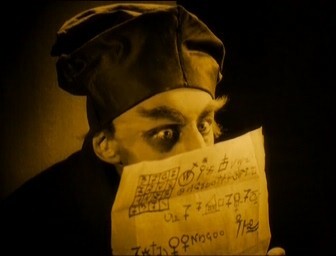 When the realtor Knock has read Count Orlok’ letter, he thoughtfully stares in space for a while and then calls for Hutter who is busy with his colleague doing paperwork. They winced looking at Knock and Hutter puts his quill back in the inkpot. 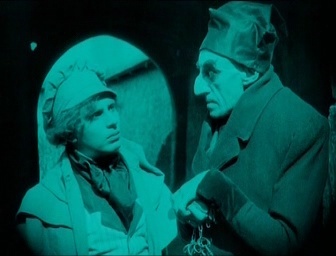 Knock tells Hutter of Count Orlok’s wish to purchase a house in Wisborg. 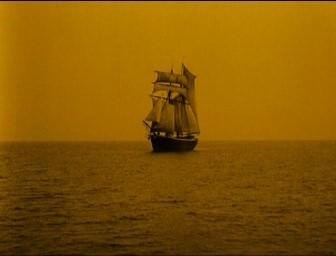 But only in the restored version this wish gets substantiated with the hint that he has a nice, barren house in mind. Hutter informed Ellen of his upcoming travel to Transylvania and just packs a few belongings when Ellen enters the room. When there is the cut on Ellen in the PD version she already stands in the room walking directly to Hutter. 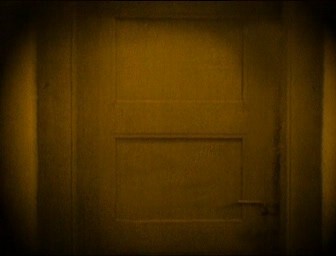 In the FWMS version the closed door opened by Ellen is seen first. Before she walks to Hutter she stays looking sorrowful at him for a moment. Hutter returns her look. Ellen walks to Hutter and snuggles up his chest. After his embrace she adjusts his collar still sorrowful looking at him. Hutter hugs his wife longer then drags himself away from her, gets her and his coat reaching Ellen both garments. He thereupon grabs his baggage and hugs her again. 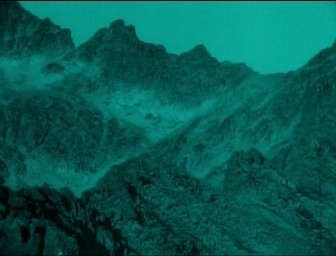 After Hutter went to bed in the Inn there is a tracking shot over the nightly mountain scenery of Transylvania. 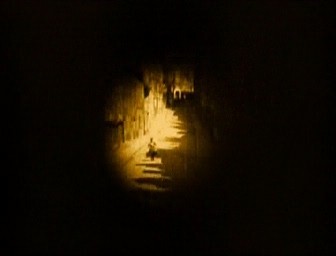 In the gray of dawn Hutter sets out for Count Orlok. 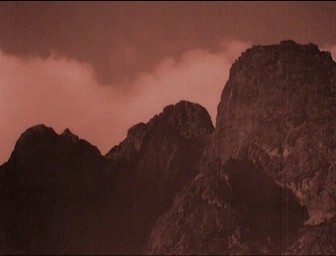 Again there has been inserted a mountain view shot in the restored version. 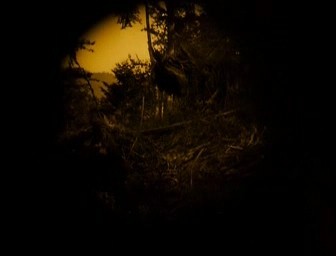 But this time it was no tracking but a static shot. The clouds in the sky are passing by. Hutter sticks his head out of the carriage. 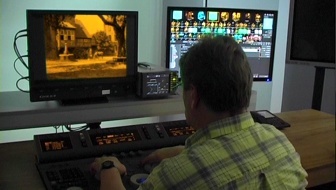 At this point, the PD version features more material because the audience already caught sight of the scene before the carriage appears on screen from the right back. 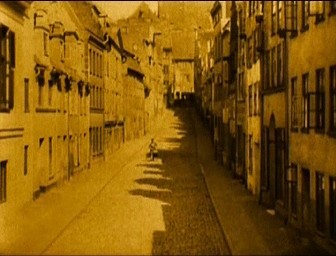 On the other hand the carriage is already on its way right from the start of this take in the restored version. 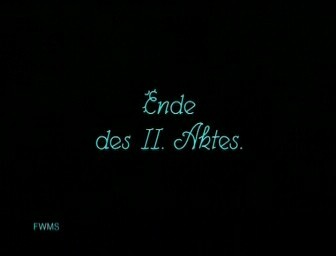 After Hutter followed Count Orlok inside the castle inter titles announces the end of the first and the beginning of the second act. A mistake has slipped in the restored version at this place. 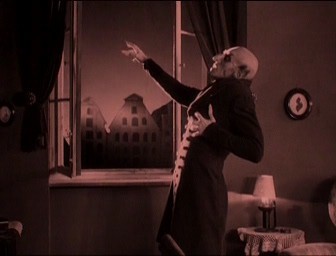 Hutter, who espies Orlok in front of his room door, runs panicked to the window searching for means of escape. 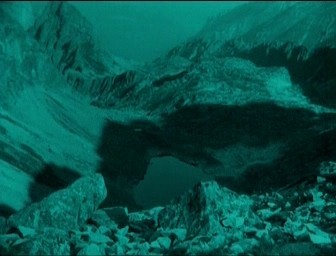 But his eyes caught a yawning rocky abyss with a winding mountain stream at the end. In the restored version this shot is upside down. 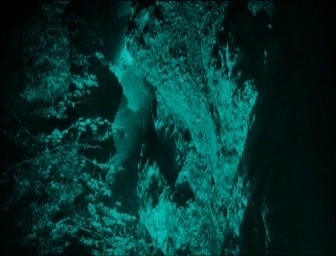 It is easy to distinguish that the water drops upwards from the crag. 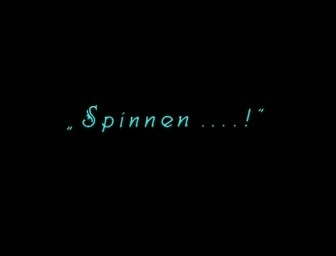 Again an important inter-title announcing a parallel action (the setting changes to Ellen yanked out of nightmares) is missing in the PD version. 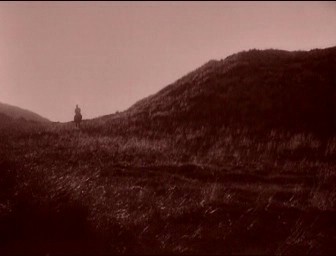 After Hutten, who is imprisoned at the castle, watched the Count coffins himself and absconds away with the carriage, it becomes abruptly clear that the Count is heading for Wisborg. 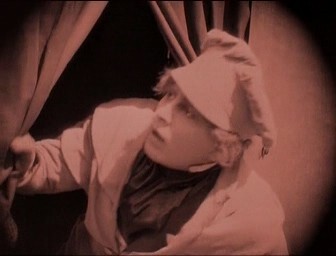 Hutter sees his wife in extreme danger, but only in the restored version he calls her name before he ropes down the window. 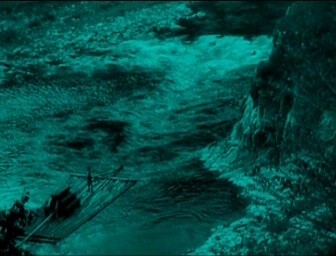 In a further setting one can see the raftsmen transporting the coffins down in the valley. 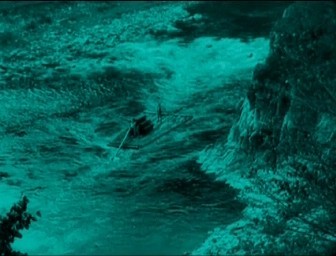 After the raftsmen sequence the second act ends and the third one is opened. 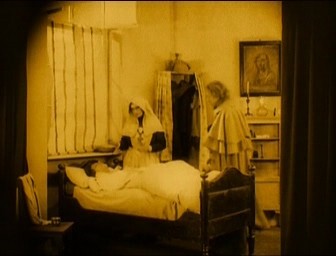 At the beginning of the third act one can see the nurse standing alone at Hutter’s bed before the doctor joins in. 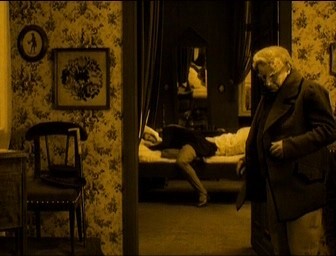 In the PD version the scene begins with the already at the bed standing doctor. 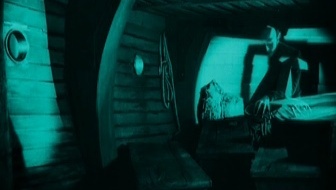 The scene where the coffins (in one of them Orlok rests) are being loaded onto the ship is only initiated by a diary entry from the narrator in the restored version. Once again an inter-title is missing where the customs officer gets instructed that the ship has to depart today. 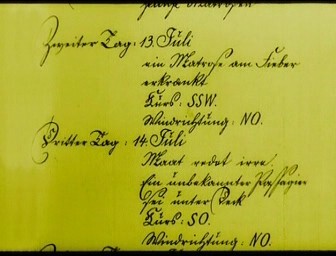 The custom officer inspects the shipping documents. 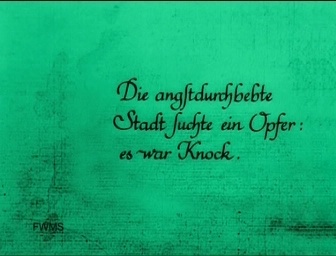 Knock meanwhile became insane has been admitted to a mental home. He fascinated points at a spider’s web whose resident is just wrapping a fly in her net. With an appropriate inter-tile he comments the scene. Here a longer sequence is missing. One can see Harding with his Sister Ruth playing cricket in front of their property while the mailman hands a letter to the gardener. He forwards the letter to Ruth whereon she reacts quite exhilarated. 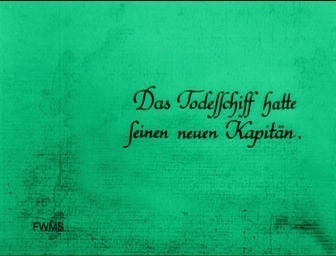 It’s because the letter from Hutter he wrote after the first night at the castle and given to a messenger. Immediately Harding and Ruth hurry to the beach to show Ellen the letter. Ellen who already was read a part of the letter takes it and starts reading by herself. Hutter, meanwhile recovered wants to continue his journey home but the nurse urges him to remain in hospital. But Hutter replies that he has to go home as fast as possible. 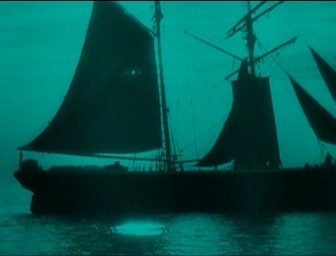 One can see the ship sailing with its sinister cargo a little longer. 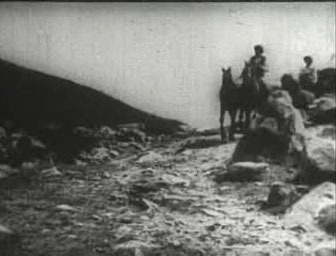 In the subsequently following scene there is an insert cut on Hutter who struggles with his horse through rough terrain to get home. 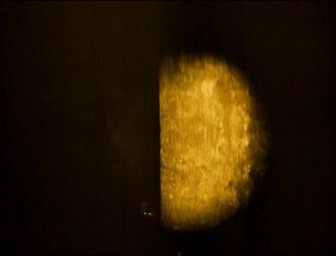 The first seconds are missing in the PD version so that the camera aperture at the beginning gets lost and results in a "hard cut". Again one can see the ship longer fighting its way through the rough sea. 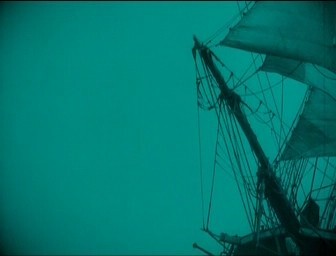 The rough sea can be seen longer then there is another take of the ship’s rig. A complete intercut is missing here. After a mate armed with an axe is on the way below deck there is another scene in the restored version of Hutter riding over grassland into sundown. This scene is completely missing in the PD version therefore the audience is directly confronted with the occurrences below deck. 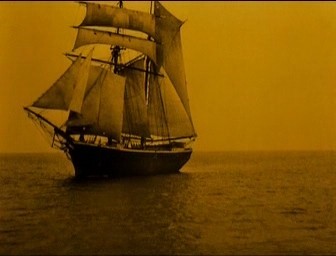 After the scene where Nosferatu enters the ship’s deck there is an inter-title in the restored version which the PD version owes us. 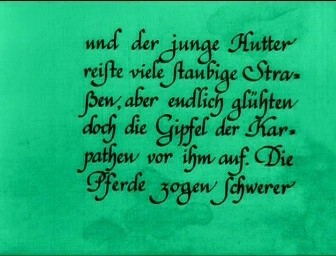 Instead of that the PD version shows an inter-title which isn’t shown in the restored version until the opening of the fourth act in 01:01:30 ("It is hard to say how the poor strength of young Hutter succeeded…"). 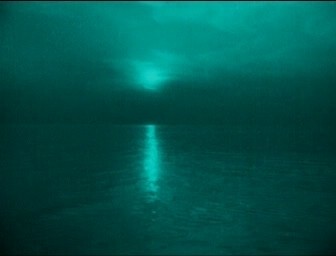 After the above inter-title one can see the ship sailing through the night. A moment later the third act ends and the fourth one is opened. Another shot of the ship approaching hailing port. Again the shown camera aperture prevents a "hard cut". 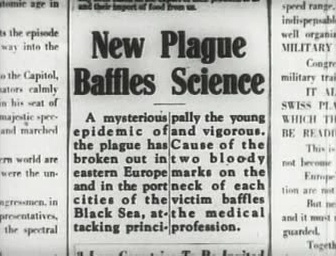 With Orlok’s arrival at Wisborg the plague arrived too. 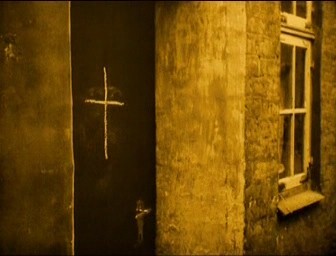 After the village herald warned the population one can see him walking down the street in the restored version. After that the aperture closes. 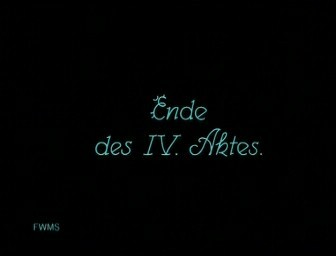 Now the fourth act ends and the final opens. 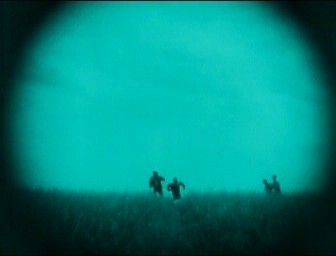 With an aperture opening the fifth act is opened. 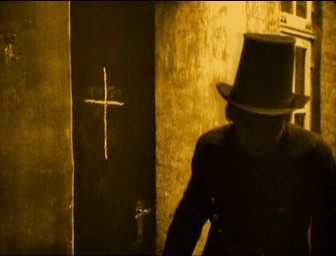 A man with a stovepipe hat walks out a door making it with a chalk cross. The PD version starts at that moment when the marking with the cross is half through. One can see that man, who signs the plague infected houses, walking out of the scenery. 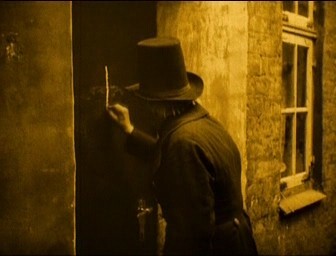 The beginning of the next scene (the man with the stovepipe hat man turns towards the next door) is also missing. 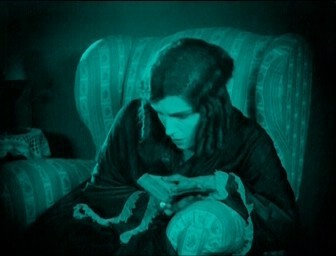 Ellen tries longer to resist the urge reading in the book of vampires. When Ellen finishes her lecture her eye is still at the book in the restored version. In the PD version she already has raised her head gazing into space. 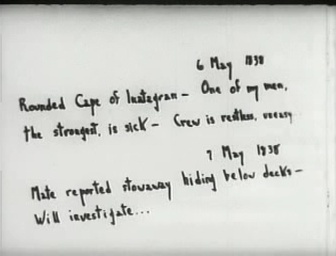 The inter-title opening the hunt after Knock who escaped from the mental home is missing. Another inter-title is missing. The PD version instead shows an inter-title which was shown in the restored version some seconds before at index 1:22:43 ("He has been seen! He has left the house! He strangled the guard to death…"). The furious crowd is still chasing Knock. 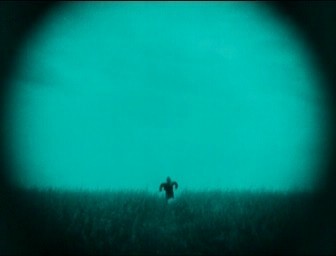 They believe sighting him in the middle of a field and rush up to him, but it is only a scarecrow. As they realize their fault they start to beat the living daylight out of it. At this point the PD version begins. Again a new scene is opened with nature shots. 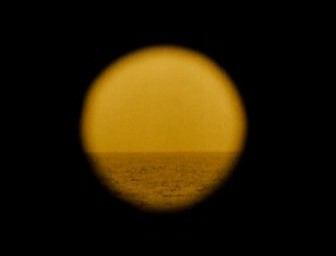 This time there is missing a shot of the sea. 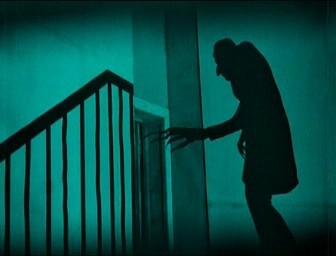 The aperture opening of the next take (Count Orlok looks out of the window of his new home) is also missing. 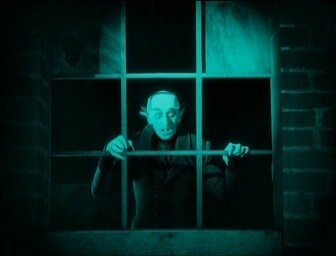 Ellen stays longer at the window looking at the opposite building where Count Orlok is just doing the same. At this point the PD version features more material. 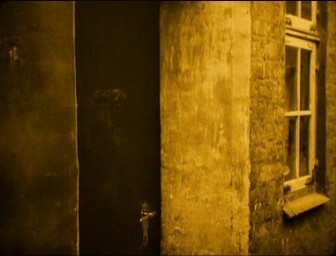 After Ellen opened her bedroom window one can see her longer staying at it. The inter-title telling us about Knock’s arrest is missing. 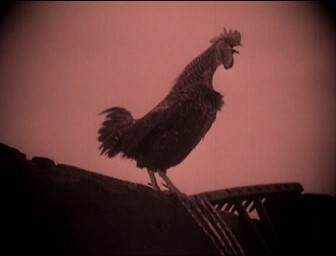 The last cockcrow before Graf Orlok’s death is completely missing. The second last setting. 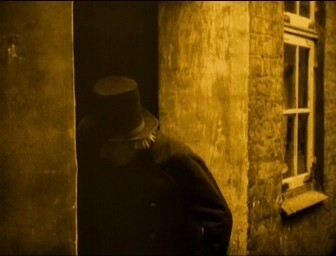 The doctor is standing at the door and in the background we see the despaired Hutter who holds his just died wife in his arms. Then the obviously shocked doctor pushes up his glasses, dries his tears standing directly in the middle of the doorframe. 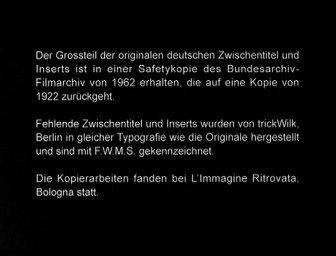 In the restored version there are the closing credits which exclusively refer on the restoration works.